This particular one is B38/W30 and $75. 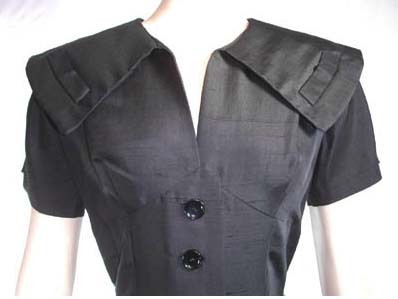 It's hard to find a good black vintage dress in top condition — obviously, because if it's flattering at all, whoever owned it first probably wore the hell out of it. I have one that I treasure, made of a fabric so stiff it can stand on its own in Chicago winds, with velvet-trimmed pockets. I imagine that the first owner died unexpectedly immediately after purchasing it (perhaps even on the way home from the shop), and that her distraught husband kept everything exactly as she had left it for, oh, fifty-five years. Which is patently untrue, and actually kind of creepy, but that's what I like to think. I'm sure nothing like that is involved in the backstory of this dress. I'm sure it was a freak landslide in the middle of the night that buried Miss Tammy's Frock Nook, preserving all the clothes inside perfectly until the construction of a new highway bypass brought them to the attention of FashionDig. Absolutely. Coincidentally, $423 is also what it costs to repair your retinas! Comes with free tinfoil hat! I don’t like this dress, it has “matron” written all over it (in invisible ink, alas). Pair it with a Mamie Eisenhower hat, black gloves and pointy shoes, you will be set to attend a 1950s-era wake. Yikes! Hee. It’s so wrong that I think “1950s-era wake” is a good look, isn’t it?I see what you mean, though. Actually, I hated the bodice until I saw how the skirt balanced it — it’s the combination of complex bodice and simple, beautifully-draped skirt that makes this one for me. I don’t mind 50s-matron-at-a-wake either, as a loook…That site is amazing. I will blame you if I actually ever write down my measurements in order to buy stuff. It’s lovely, but I would look like a moose in shoulder pads in it… (ignoring the fact that I wouldn’t actually fit into it, although this is closer than many…) Wow. Much ellipse abuse. I love this site very much, btw. That may be the One True Dress. That dress is me! Me me me! I need that dress! I’d snap it up, but my size is in flux, and it deserves an owner who will love it for longer than a couple of months. I will have to contemplate its details and incorporate them into something else. 1950s-wake-style is a-ok with me. The purple streak in my hair tends to undercut the severity of anything like that when I wear it. That, and my constant cheeriness. THAT that is lovely its fantastic …..when you look at it,it almost hitmotizes you!!! !